Our application for the Pepsi Refresh Project was accepted! We are in the running for the $250K grant. This money would be used to make desperately needed improvements and repairs to the property, which will help us provide even better care for our residents. Voting is open until 11:59 p.m. on September 30th. At the bottom left corner, you'll see "Welcome!" Below that, you will be asked to sign in or "Join Refresh Everything"
You may also vote from your mobile phone by texting 102554 to 73774 (standard texting rates apply). You are given 10 votes per day, but may only vote once per day per idea. If you are looking for other ideas to vote for, our friends at Wolf Connection in California are in the running for the $25K grant. Photo of Trey with River and Guenny courtesy Sharon Greene. Our thanks all our attendees, and to the designers and their film crew for helping create a most memorable experience. Also, we would like to thank all the vendors who donated food, beverages and other items. The complete list of vendors can be found at the bottom of the newsletter. Our thanks too, to all our volunteers, who put in extra hours to help ensure that everything ran smoothly. The animals that we took in from the sanctuary in Henderson County that was forced to close due to breed specific legislation are on-site. Tatanka (a former FMF resident) and Roxie are adjusting to their new surroundings. Roxie has even started to make friends with a few of our volunteers! The animals that formerly belonged to the South Carolina breeder are also on site. They're slowly adjusting to their new home. Some of them have already warmed up to our volunteers, and gladly come up to give kisses and get skritches. A few are still very shy. What has helped with them is having their former caretaker (not the breeder) living on the property and helping care for them. His presence is very reassuring to them. Almost all of these animals will need their rabies shots updated. As it's time for most of our other residents to have theirs done too, the new residents will be added to the list. That's 52 animals who need rabies shots, at a cost of $8.00/shot, for a total of $416.00. Most of the new residents will also need to be altered, at an approximate cost of $110 per animal. The new animals have raised the total number of animals to 76, and have increased our food bill by about $40.00/week, and our budget by 15%. We could certainly use help covering the veterinary and other expenses, and are grateful for any assistance that you can provide. If you are interested in sponsoring any of these animals, please email info@fullmoonfarm.org. Thank you. Photos of Tatanka and Roxie courtesy of Michele Frankl. This month, it's Noshoba and Maia! Noshi and Maia came to Full Moon Farm in 2003 after Eagle Wolf closed. Noshi is a big fluffball who has slowly warmed to our volunteers. He will often come bouncing up to the fence to get attention. He will still only allow Nancy and her daughter, Josie, to groom him. We had some concern that he wasn't able to get into the dogloo, so a more conventional-looking doghouse was moved into their pen (after the doorway was modified to fit him). He hated it. He ended up adding a basement to it, which made digging it out this winter rather...interesting. He now has an extra-large dogloo, and he fits in it without issue. Maia had been picked up as a stray in Ohio prior to being sent to Eagle Wolf, and was never been properly socialized. We joke that she's something of a backside-biter (not that she ever has), because she has a tendency to lunge at the fence and snap when someone walks by. She is still very uneasy whenever anyone comes in the pen, and will stay on the opposite side. Lately, she has started expressing an interest in some of the volunteers. If Noshi is at the fence receiving attention, she will walk up slowly to sniff a hand (that is safely on the other side of the fence), and doesn't do her usual "charge the fence" routine after. We're not sure what's prompted this slight change in attitude, but we like it! Photos of Noshi and Maia courtesy of Michele Frankl. 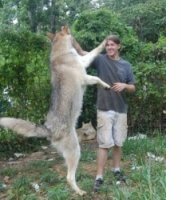 Come check out the Full Moon Farm Wolfdog Rescue & Sanctuary's information booth on Saturday the 18th in our theatre lobby at The Carolina Asheville & meet one of their "Ambassadogs" live in person! Help support the rescue team and enter to win $1.00 raffles for one of two Dancing Bear Toys gift bags, including a stuffed wolfdog plushtoy & a $10.00 Gift Certificate! Photo of River courtesy of Meg Ellis. Please join us on Thursday, October 7th for our 6th Annual Howl-Raising Auction! The auction will be held at White Horse Black Mountain, 105C Montreat Road, Black Mountain, NC. Doors open at 6:00 pm, and the event runs from 6:30 - 10:00 pm. Admission is $10.00, and includes hors d'oeuvres. Cash bar. This is a combination silent and live auction. The live auction will run from 7:00 - 8:00. The winners for the silent auction will be announced at 8:45. The talented and versatile Jennifer Smith will also be performing two sets. The first set will start at 8:00; the second at 9:15. Ms. Smith has performed with the Asheville Lyric Opera, and most recently won the Great Blue Ridge Talent Search. If you have items that you would like to donate to the auction, or if you would like additional information about this event, please call 828-664-9818 or email Sarah Hallback at sarah@fullmoonfarm.org. Our next Howl-In is Saturday, September 25th. Tours of the Farm start at 3:00 p.m. Potluck supper begins at 5:00. $5.00 donation includes main dish and soft drinks. Bring a side dish and join the fun! Photo of Pretty Girl courtesy of Ryan Talbot. We will have a table at the Mill Around the Village Bluegrass Festival in downtown Swannanoa on Saturday, September 25th from 11:00 a.m. to 5:00 p.m. The festival will feature live music, local food vendors, local arts and crafts vendors, a children's area and a chili cookoff. The Swannanoa Valley Museum will have displays and tours. Directions to the event are available on their website. Below are the businesses that donated items for our Pawty. We thank them for their donations! Bi-Lo Grocery of Black Mtn. Nori Sushi of Black Mtn. TC Country in Canton, GA has donated large amounts of canned and dry food and supplements to the Farm over the past year. We are grateful that Sabine and Fabio are friends of the Farm, and thank them for all the support they have provided to us. Once again, our vet, Dr. Beverly Hargus, has gone above and beyond the call of duty. Just prior to the start of the Pawty, two of our residents had an altercation over some treats. (They were two of our new residents, and the person who gave the treats didn't know that one of them has food issues.) Dr. Beverly was in attendance, and vetted the injured animal while in her Pawty clothes! Our thanks to Dr. Beverly for her timely assistance. We are looking for a few good, civic-minded people who would be interested in serving on our Board of Directors and helping the Farm grow to the next level. Non-profit experience is required, along with fundraising and/or volunteer recruitment experience. If you are interested, please contact Nancy at nancy@fullmoonfarm.org. Thank you! We are in need of a CPA to assist us in filing our IRS 990 forms. The filing deadline is January 15, 2011. If you are interested, please contact Nancy at nancy@fullmoonfarm.org. Thank you! The forecast is for a rough winter once again. We are still in need of tree repair, driveway work, and firewood. The Farm's van has 230,000 miles on it, and Nancy's truck has 246,000. Any contacts on reliable 4WD vehicles or used car dealers is needed! If you can help with any of these, please contact Nancy at nancy@fullmoonfarm.org. Thank you!